Fresh garden radishes from our planter harvested almost every Sunday for salad. Red and white, long and round radishes looks like Minion in my sights. It’s good not only for salad but pickles based on ume vinegar. 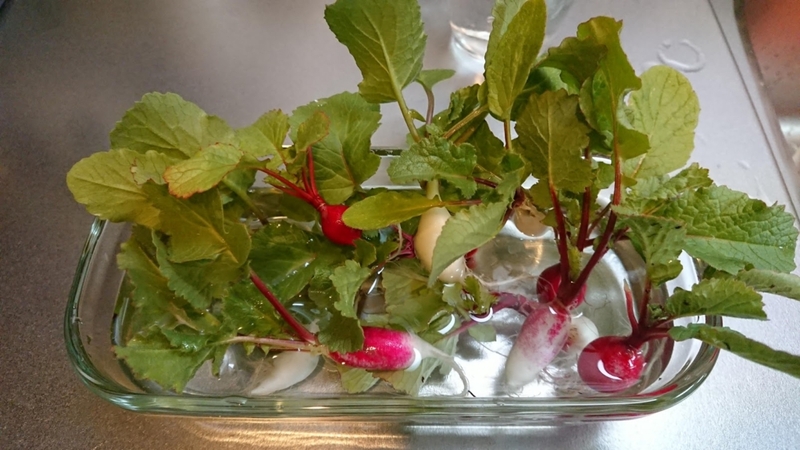 Garden radish can be cropped in 20 days but in 40 days or more in winter. A little fertilizer is required. It’s necessary to get a lot of sunshine and well drained. You need to pay attention to replant failure. Good for salad in early time to crop. Big white radish familiar to Japanese is just called “Daikon” or “Japanese White Radish” in English. The western wasabi seasoning assorted roast beef is also called horseradish. Kaiware Daikon is radish sprouts or radish shoot. Daikon Oroshi (grated radish) is popular with Tempura. The derivation of radish is a “root” from Latin.